Despite the obvious return on investment, not everyone has two to three years to devote to earning their MBA. Pursuing an accelerated MBA may be a wise choice for students unfazed by a rigorous workload. An accelerated MBA provides is an attractive alternative to longer programs. Fast-tracking your degree will cut both costs and time, and allow you to propel your career forward as quickly as possible. For those hoping to bring a comprehensive knowledge of business fundamentals to their industry without the daunting time commitment, we’ve laid out a couple of the best San Diego accelerated MBA programs. 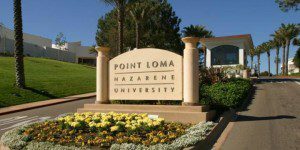 The Fermanian School of Business at Point Loma Nazarene University offers a One-Year MBA for students looking to obtain their degree with efficiency. The daytime One-Year MBA halves the time of the Evening MBA, which takes 24-28 months to complete. This track requires students to earn 42 credits, as well as participating in a Field Experience. The Field Experience thrusts students into an business environment, wherein they have the opportunity apply their classroom knowledge to hands-on company work. This program is designed for recent graduates. In addition to taking the One-Year MBA, students who can commit more time to the program have the flexibility to take on more courses and obtain their degree more quickly. This program helps promote the university’s core Christian values, specifically geared toward students aspiring to use their education to actively better their community. Fermanian integrates the what they believe are the core categories of career success into their curriculum: business knowledge, hands-on experience, purpose and networking. Even the school’s concentration options demonstrate their commitment to developing upstanding leaders. Students can pursue a concentration in Healthcare, Sustainability, Organizational Leadership, or Not-for-Profit. Another distinguishing facet of this program is its unique elective options. Fermanian even offers a gold class to help students with networking. The Accelerated MBA at Alliant School of Management is offered to students that meet specific requirements. Only Alliant undergrads qualify for this track, and they must be pursuing either a B.S. in Business Administration or a B.S. in Political Science. They must also maintain a GPA above 2.75. Though the number of students who meet these specifications is limited, those who are eligible for this track can complete their MBA in as few as two semesters. The program entails the following bridge courses students can take during their senior year: Organizational Behavior and Global Leadership, Statistical Analysis and Modeling for Business, Strategic Management and International Marketing Management. In order to transfer these courses into the MBA program, students must obtain a B or higher in each one. Since students in this program take MBA courses while they are still undergrads, they will have completed for of their required fore classes by the time they officially enter the MBA program. Alliant is particularly supportive of veterans. The school has made the “Military-Friendly Schools” list in GI Jobs magazine three times, and has been on the Military Times EDGE magazine’s “Best for Vets Colleges” list twice.